A full size, detailed blueprint of the Rife Prismatic Microscope body is now available. This blueprint was originally drawn by John Crane.The microscope body is similar to the prismatic canister bodies used in the #s 2, 4, and 5 Rife microscopes. This blueprint lists all dimensions, screw sizes and necessary materials, which were copied from an actual Rife microscope. The body is designed to mount a standard objective and ocular lens. This could easily be binocular oculars and a multi lens turrret for the objectives, just as Rife built his microscopes. But one will have to machine the ends of the prismatic barrel to fit your particular application. Further it will also be up to the constructor to design and adapt a condensor lens holder and light source. No one is producing the finished prismatic body at this time. 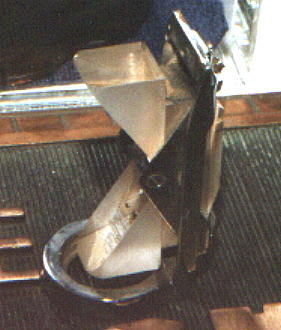 The internal prism arrangement is a modified version of the actual Rife design and was created by John Crane. An actual Rife prism array can be seen in the picture at the top of this page. If one looks closely, the Rife prism array is made of 5 different prisms. There were two of these array's in the original Rife microscope. I do not have plans for Rife's prism arrangement. The Crane modified prism mounting arrangement is much simpler and uses a total of 4 quartz prisms inside the barrel. John Crane built and sold this microscope commercially. I have heard from a reliable source that an estimated 100 these prismatic microscopes were built by Crane. Plans are included with the blueprint that show exactly how the prisms are to be modified for use. It is known that Rife filled the barrel of his microscopes with glycerin. A method will have to be devised to seal the objective end of the barrel if a constructor decides to do this. A flat piece of optical quality glass should do nicely for a seal. Dr. Rife was able to exceed 30,000 diameters of magnification with full resolution using his prismatic design. Some people say this is impossible, as one cannot resolve beyond the wavelength of light used to illuminate the specimen. This is a false assumption! Recent research at the Louis Pasteur University in Strasbourg France, and at the NEC Research Institute in Princeton, NJ has shown that light can be squeezed through holes as much as 10 times smaller than it's wavelength! NEC is now producing a fiber image guide that offers submicron resolution using this principle. Please understand that no one that I know of has used this set of plans to construct a microscope. I believe that these plans are a good starting point, but without the actual Rife prism arrangement the microsope may not work as well as Rife's. The blueprint is wall poster size at 2' X 3', and costs 24 dollars,which includes shipping in the USA and Canada. Out of US shipping is an additional 6 dollars. Please go to the Order Page to Order.